The Greek philosophers passed their ideas about atoms down to us. Their word “atomos” meant “cannot be divided or cut.” Anaxagoras (5th century BC) reasoned that the bread we eat changes into bones and flesh. Therefore, bread must be made of very small things that are rearranged in our bodies. He imagined that our bodies are compounds of the Greek elements. Bones were two parts earth, two parts water and four parts fire. Anaxagoras’ influenced Leucippus and Democritus (4th century BC). Democritus noticed that we smell baking bread, but we cannot see what we are smelling. Therefore, bread must be made of extremely small particles. He noticed that sound travels through solids, therefore, they must contain voids so tiny that the particles can jostle each other. 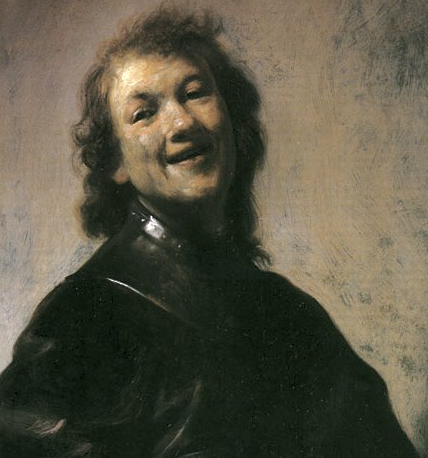 The painting of the Young Democritus (the laughing philosopher) may be a Rembrandt self portrait. Three hundred years later, the Roman poet Lucretius explained the Greek atomic theory in his book: On the Nature of Things. 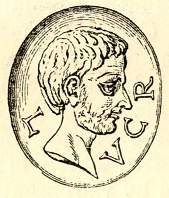 The illustration of Lucretius is from Seyffert’s “A Dictionary of Classical Antiquities, 1899. Lucretius explained that matter is made of the tiniest things (atoms) that bumped into each other as they moved around in a void. He used the dithering of tiny dust particles suspended in the air (seen when sunlight shines into a dark house) as evidence for the motions of atoms. Lucretius thought the tiniest things were solid and unchanging, yet he also believed that everything material continues to deteriorate. Lucretius rejected gods, religions, creation stories or expectations that the dead will face a future judgment. He thought the mind (the soul) was just atoms. Some people today also imagine that the mind is just chemical processes and our existence ends when we die. Lucretius explained beginnings by claiming the Earth grew (the atmosphere, seas and lands increased in size) as tiny atoms assemble together. (The theory that stars and the Earth assembled from space dust is popular among many scientists today). The Earth can also shed atoms, as some of them wander off. A third process is at work as the Earth changes size: the Earth from earthy substance grows (II line 1673). Long ago, the Earth gave birth to huge animals (think dinosaurs). Now it only produces small animals. Lucretius wrote that the great Earth’s walls are attacked and fall into decay and crumbling ruins. All things gradually wear out, exhausted by the long lapse of time as the atoms continue to change the way they moved. The notion that matter is changing its volume or wearing out with age separates ancient atomists from modern ones. Classical atomists thought only the indivisible things, similar to modern notions of a god particle, do not change. Ancient atoms did not have complex structure (nucleus surrounded by a distant shell) like modern atomic theories. According to Lucretius, the atoms had different shapes. Water was made of smooth atoms that could slide around. Bitter things were made of sharp atoms. Rough atoms rub against each other producing heat from friction. Lucretius died 100 years before the apostle Paul predicted an atomw (an instant so short it cannot be divided) when the dead will be raised, but it does not mention atoms. The Hebrew creation account tells us how the Earth got its form. First God created (completed action) the entire universe, the heavens and the Earth. However, the Earth at that stage was (completed verb) unformed and dark, although it had a surface. Then God’s wind dithered intensely and in unbroken continuity above the primordial abyss. as He continued to command light to continue to be. Indeed, light dithers in unbroken continuity within all matter giving it extension and other properties. Matter is not tiny solids. It is a relation with light. The Bible mentions the house where light dwells. The house of light has a border. It is a place of darkness perhaps because the paths of light within its house are mysterious. It is also an extremely ancient house. Atoms are the oldest things we can observe in the universe. Does matter change itself as it ages, as Lucretius and all ancient people believed? We observe that the earliest atoms shone at less than 10% of the frequencies emitted by modern atoms. We observe the history of the universe at many ranges. In general, the closer the galaxy, the more its atoms shone at higher frequencies. The fastest normally energized natural atomic clocks are local. Even local atomic clocks, when compared to their transponded reflections from hours ago, are observed to accelerate. NASA sent radio signals derived from hydrogen maser atomic clocks to four distant spin stabilized spacecraft (Pioneer Anomaly). The atomic clocks from the past (relative to distance) were running slower than the atomic clocks of the moment in the same manner as the atomic clocks in hundreds of billions of ancient galaxies. How could matter change as it age? We build stable and strong structures with matter. The apostle Paul explained how the creation is enslaved to change. He used orderly submission and together verbs to describe this universal degeneration. Things that changing in an orderly together manner – change relationally. The fact that matter changes relationally is an observation. We can compare with telescopes in all parts of the light spectrum how ancient matter shone differently than modern matter. We confirm that matter is changing RELATIONALLY, because we observe how galaxies formed. They started out as tiny and naked, then the stars came out, accelerated out form the core as billions of galaxies grew into huge growth spirals. The space matter takes up, its inertial properties and its light frequencies all changed together (that is relationally). These early galaxies are observed ejecting distinct star globs (of different colors than the core). The stars globs spread out and accelerate out along with the accelerating atomic clocks . Pictures are from NASA and the Hubble Ultra deep Field. If you have never examined science’s first principle, read about this historical assumption on this web site.